In an attempt to make the site a little easier to use for newcomers or really just anyone, I’ve implemented a quick glossary in the player pages. 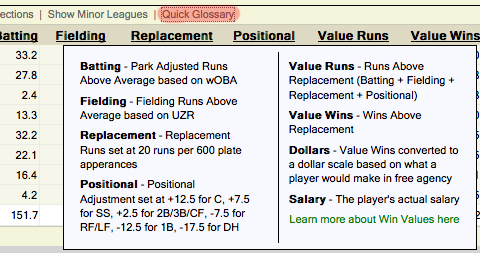 Just click on the quick glossary button in any section on the player pages and you’ll get a quick overview of all the stats in that section. This will probably make its way into the leaderboards too. Someday we’ll get around to updating the actual glossary…. We hoped you liked reading The Quick Glossary by David Appelman!